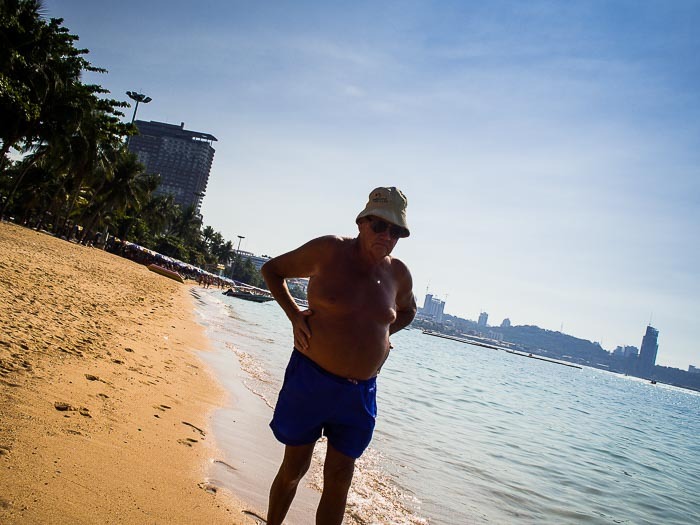 A tourist on Pattaya Beach. Pattaya is both the most famous and infamous beach in Thailand. Fifty years ago it was a lovely stretch of sand southeast of Bangkok. Then the US military started using it as a R&R destination for soldiers, sailors, marines and airmen fighting in Vietnam and modern Pattaya, with all that has made it notorious was born. 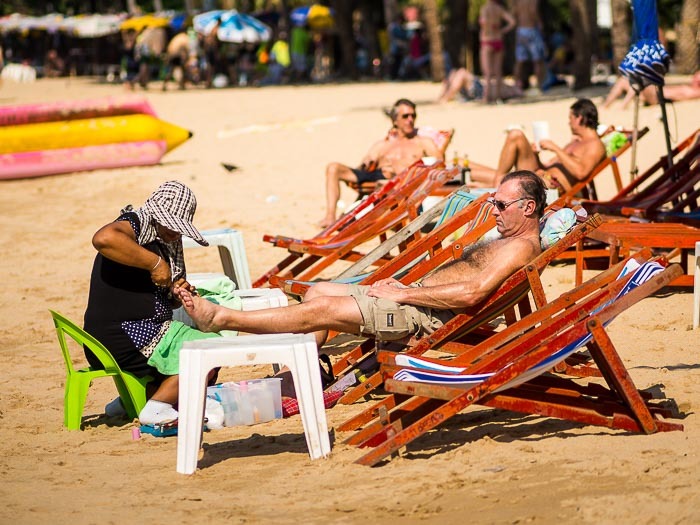 A European vacationer gets a pedicure on Pattaya beach. Pattaya has been in the news in Thailand a lot in the last few years. All beaches in Thailand are supposed to be public property, but vendors have claimed much of the beach as virtual private businesses. You could hardly sit on the beach without being harangued by vendors selling you food, offering pedicures or massages, and, perhaps most aggressively, trying to get you into beach chairs and under umbrellas. 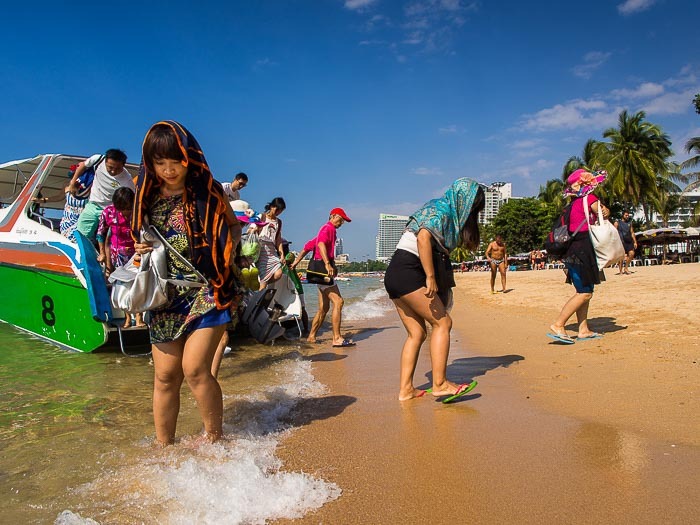 The military government has cleaned up other Thai beaches, like Patong on Phuket, but they've left Pattaya alone, primarily because the local government has promised to clean up its own mess. All of that is about to change. The government is zoning sections of the beach to be vendor free. One day a week, reportedly Wednesdays, vendors will not be allowed on the beach at all. Chinese tourists get off a speedboat after a tour of islands near Pattaya. All of this comes at a difficult time for Thailand and Pattaya. Tourist arrivals in Thailand are still down, a lingering effect of political violence that gripped Bangkok in 2013-2014. The imposition of martial law and resulting coup in May stabilized the situation but has not restored tourists' confidence in Thailand. 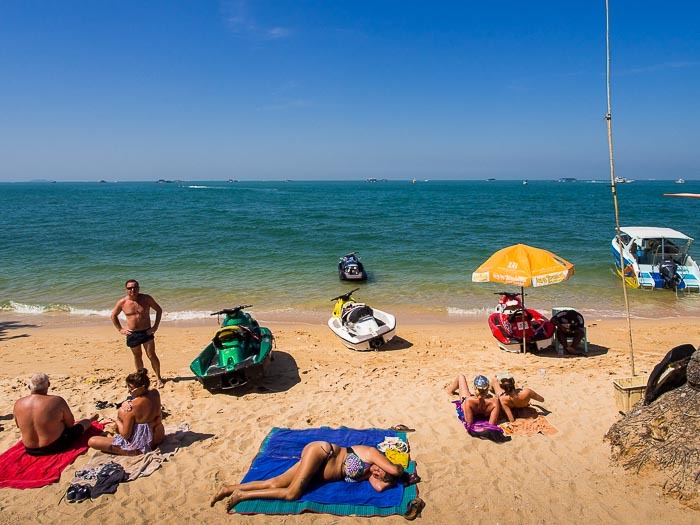 The bright spot in Thai tourism, Russian tourists in Pattaya and Phuket, has been hit hard by the collapse of the Russian Ruble. It's not clear if the efforts to clean up Pattaya will actually bring families back to the beach. There are more photos of Pattaya in my archive or available from ZUMA Press.